How you get energy; how you use it. The energy for all physical activity comes from the conversion of high-energy phosphates (adenosine triphosphate—ATP) to lower-energy phosphates (adenosine diphosphate—ADP; adenosine monophos- phate—AMP; and inorganic phosphate, Pi). During this breakdown (hydrolysis) of ATP, which is a water-requiring process, a proton, energy and heat are produced: ATP + H2O —© ADP + Pi + H+ + energy + heat. 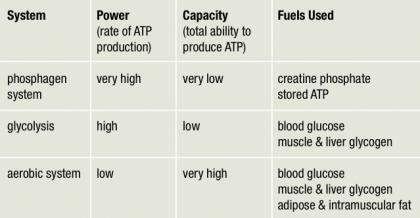 Since our muscles don’t store much ATP, we must constantly resynthesize it. The hydrolysis and resynthesis of ATP is thus a circular process—ATP is hydrolyzed into ADP and Pi, and then ADP and Pi combine to resynthesize ATP. Alternatively, two ADP molecules can combine to produce ATP and AMP: ADP + ADP —© ATP + AMP.